The number of threads (1T, 2T,…) is indicated. In case of the Opteron system, this was a 2-socket dual-core 2GHz box and the 2-thread data was correspondingly measured on one (1S) or two (2S) sockets, respectively. Proper NUMA placement was implemented. The “Conroe” system is my standard Core2 workstation. 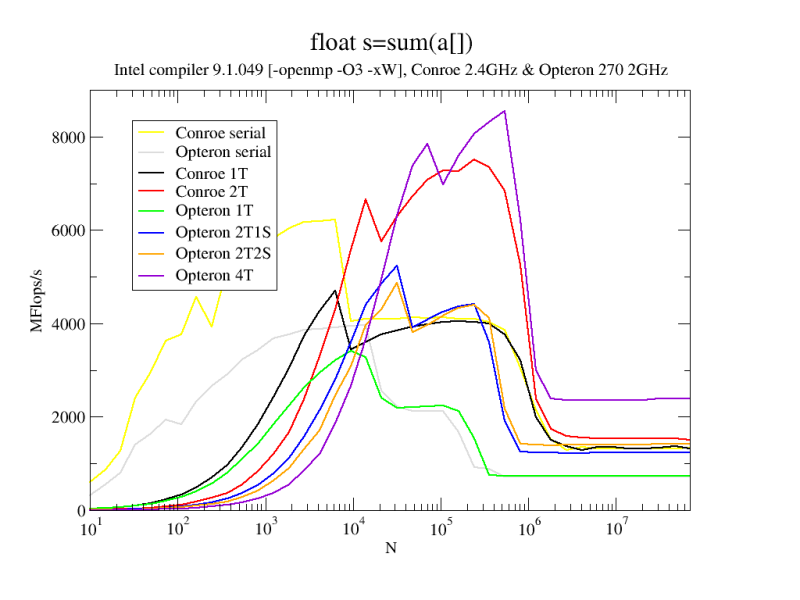 Data on purely serial runs (no -openmp) is shown for reference. In contrast to low-level benchmarks like the stream or vector triads which have more read streams and at least one write stream, there seems to be a lot of “headroom” for the second thread even for large N on an Opteron socket.